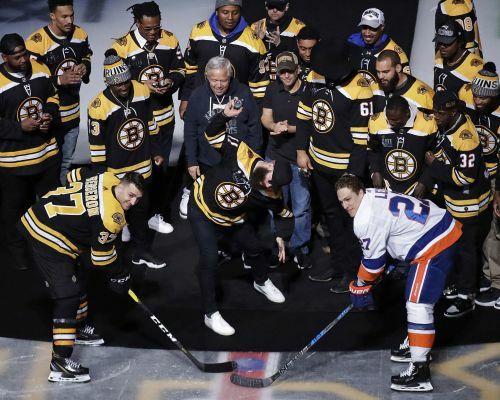 The game was delayed for a few minutes for a ceremonial puck drop featuring the Super Bowl champion New England Patriots. NEWARK, N.J. (AP) — Tyler Toffoli scored twice in 35 seconds early in the third period to spark Los Angeles past New Jersey. Adrian Kempe, Dion Phaneuf and Ilya Kovalchuk also scored for the Kings. Jack Campbell made 29 saves and Anze Kopitar had three assists. WASHINGTON (AP) — T.J. Oshie scored as part of a dominant performance, Braden Holtby made 30 saves and stopped a penalty shot and Washington beat Vancouver in Jay Beagle's return to his old home arena. Alex Ovechkin assisted on Oshie's 16th goal of the season to pick up his 1,180th career point and become NHL's all-time scoring leader among Russian players. Ovechkin went into the game tied atop that list with former teammate Sergei Fedorov. Holtby made 13 saves and denied Bo Horvat on a penalty shot in a busy second period to help the struggling Capitals pick up two important points. Markus Granlund also scored for the Canucks, who lost for the second consecutive night and have dropped three of four. PITTSBURGH (AP) — Curtis McElhinney stopped 23 shots, Brett Pesce and Jordan Martinook scored from way out and Michael Ferland and Andrei Svechnikov poured it on late as Carolina began a pivotal five-game trip with a victory over Pittsburgh. SUNRISE, Fla. (AP) — Vince Dunn scored with 3:53 left to cap a third-period rally from a two-goal deficit and lift St. Louis over Florida. MONTREAL (AP) — Brendan Gallagher had two goals and an assist and Montreal beat slumping Anaheim. Jesperi Kotkaniemi and Phillip Danault also scored for the Canadiens, who improved to 7-1-1 in their last nine games. Jonathan Drouin had three assists. Carey Price made 24 saves for his sixth straight victory — his longest winning streak since the 2016-17 season. Price is six victories away from tying Jacques Plante for most wins in franchise history. Ryan Getzlaf scored for the Ducks, who have lost five in a row. Chad Johnson stopped 28 shots. BUFFALO, N.Y. (AP) — Sam Reinhart scored the lone shootout goal and Buffalo won for just the third time in nine games by beating Minnesota. Minnesota defenseman Jared Spurgeon scored twice and Charlie Coyle also scored during a three-goal second period. Devan Dubnyk stopped 35 shots.